Referrer is a variable that is automatically transferred with your requests that you make on the Internet. If you click on the link to the RefControl Firefox add-on on this site, the Mozilla website will see the url of this article as the referrer which simply means the domain and page the user came from. But clicking is not the only option. When a site loads contents from third-party sites, a referrer is used as well. Sometimes the referrer is empty if you enter a url directly in the location bar. There are other cases where the referrer may not be transmitted. If a https page requests contents from a http page, when you open a website from your bookmarks or the browsing history, or when a url is opened directly from the operating system, for instance when you click on a link in a desktop email program. Controlling the referrer variable can be useful under two circumstances. The first is plain paranoia. You do not want that sites can track your movement or know where you came from. This is probably going a bit far but some may find it useful. If you block the referrer, sites won't see it when you click on links or when you visit websites that request contents from other sites. A far more interesting option is the second in my opinion. Some websites protect their content by using referrer checks. If you take the Wallstreet Journal Online site for instance. They check if a visitor came from Digg and if that is the case, display the whole article. If you open the site directly you only see an excerpt and are asked to sign up and subscribe before the full article is made available to you. 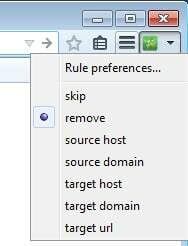 RefControl is a Firefox add-on that can change the referrer on a per site basis. If you want to use digg.com as the referrer when visiting wjo.com and the normal referrer on any other site then this is your extension. By default the normal referrer is being used if no matching site is found in the user edited list of sites. You need to create a custom list to use the extension. While that is easy to do, you may prefer an automated option instead. That's where Referrer Control comes into play. Referrer Control is another extension that can be used for the purpose. It ships with seven initial configurations that you can switch between. skip: means no change, the referrer is kept as is. remove: removes the referrer so that none is sent. This means a blank referrer is sent. target host: change referrer to target host name, meaning the host name of the requested resource. target domain: change referrer to target base domain name. target url: changes referrer to the full target address. It is additionally possible to create custom rules which have priority over the base rules. If you notice that a site is not working properly after having installed Referrer Control, you can either try switching between different default rules, or to create a custom rule for the domain. This can be useful to automate the process. Say you have decided to remove referrers so that nothing is sent. Some sites may not work correctly in that case. To correct this, you create a custom rule that enables the referrer for them so that they work again.